Home » Posts Tagged "screens"
I have been having a sneak look into Tapstore’s newest addition to there up and coming expansion of products their Square bath shower screen which will be launched in November they have carefully selected three styles of bath screens the square the square extension which has an extra section to extend the length and a curve the same as the square with a rounded corner. The experience the Tapstore team have in the bathroom industry always sets themselves apart from other online retailers, they are not just a company of internet tech heads, Paul Smart (development director) has been designing bathrooms for some 25 years now and with the experience of the other senior members of the tapstore board behind him there is a powerful team that always know what products to select. Although they would not let on how much the RRP will be I have been told sub £200.00 that will be a splash in the face to the competition. Claygate Distribution Ltd are proud to introduce the stunning new Ecocube Shower Bath with Contemporary looks and eco-friendly credentials to their Artisan range of luxury bathroom products. The Baths are manufactured using a technically advanced laminating process called Corincast, which makes a solid, super-strong acrylic product. Extra layers of fibreglass and reinforced polyester resin are added during production, giving the bath superior torsional rigidity. The last layer seals the shell and makes the underside of the bath smoother and easier to handle. This cutting edge design combined with the newly developed Corincast technology means that the baths use 25% less water than comparable baths while the extra layers of fibreglass give greater insulation, resulting in the bath water keeping its temperature for longer. 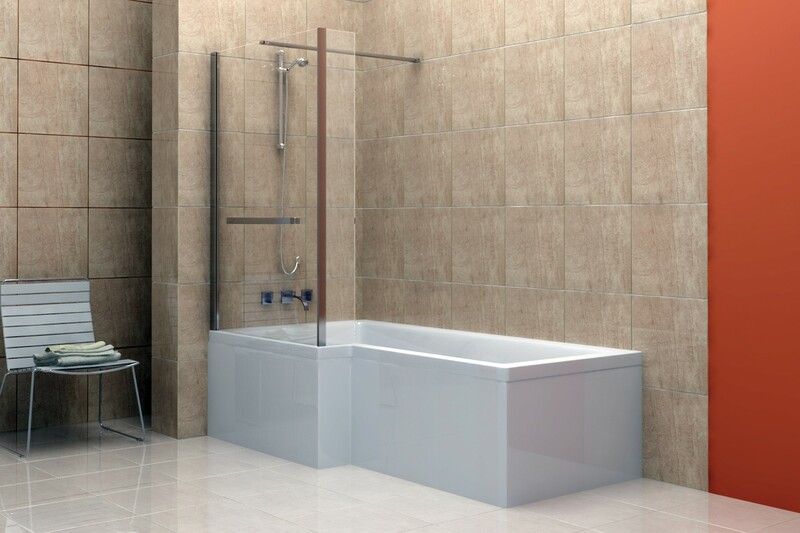 The Ecocube Shower Bath has a huge 850 x 850mm showering area that comes with a choice of two 6mm glass screens; a fixed screen with L-shaped return for water retention and wall-fixed chrome support rail for complete rigidity or a straight screen with chrome barrel hinges that are universally handed. The bath is supplied undrilled and are available in left or right-hand versions (the left-hand version is shown here). The bath is supplied with no tap holes and can be drilled if required to suit. 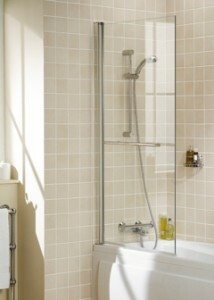 RRP £929.00 complete with bath front panel and straight screen and barrel hinges. RRP £1085 as above with fixed screen as seen in the above image. Lakes Bathrooms Have announced that all their silver anodizedÂ finish doors and Shower enclosures will now come as standard with their AllClearâ„¢Â stay cleanÂ coating at no extra cost. Lots of manufacturers have a versions ofÂ glass treatment for shower doors and screens like ClearShieldÂ® but none offer this as a standard feature. How does it workÂ ? Look into a microscope and you would see that standard glass actually has a pitted surface to which water, lime scale and soap scum can cling, building up with every shower and requiring regular scrubbing to keep your enclosure clean and hygienic. Inspired by nature, AllClearâ„¢ coating forms an invisible, microscopically smooth shield to prevent this build up of grime. AllClearâ€™s hydrophobic properties cause water to run off freely, washing away residue and dirt as it goes.